Crispy five spice sliced angus beef brisket (五香脆安格斯腩片) - not as good as I remembered from my first visit. Today this was a little dry and cold by the time I got to it. Smoked egg with Oolong tea leaves and black truffles (黑松露茶薰蛋) - oh this was real good… I expected the smoky flavors but didn't count on the acidity that came with the little bit of black truffles on top. Suckling pig knuckles in abalone sauce (鮑汁豬仔腳) - not sure I picked up the abalone sauce, but never mind… Oink, oink! Wok-fried crystal king prawn with honey-glazed Yunnan ham (蜜汁雲腿伴玻璃蝦球) - ho-hum. Yes, the prawn was big… and yes, the chef had scored it so that it resembled a flower - like a peony or a rose. But it tasted kinda bland. This was a dish that I stopped ordering at Tim's Kitchen (桃花源), and this isn't better than the one at Tim's Kitchen. The Yunnan ham here also didn't really do it for me. Double-boiled chicken soup with fish maw and coconut (椰皇花膠燉土雞湯) - this was some delicious chicken soup! Love the unexpected layer of coconut flavor. However, the fish maw was VERY fishy… in fact I've never ever had it so strong. Wok-fried Canadian scallops with black truffles and sea urchins (黑松露海膽帶子皇) - the execution of the scallops themselves were absolutely flawless - leading to a texture soft and tender. Was there sea urchin in this? I had no idea… since I couldn't pick up the taste. Obviously there was some crab meat, and the strong flavors from the ginger, spring onions as well as the pea sprouts overwhelmed everything else. Wok-fried spotted garoupa fillet with Yunnan ham and spring onion (腿茸薑蔥爆東星斑球) - I'm biased here because I don't think good fish should be prepared as fillet… but in all honesty this was not bad, and I found myself eating up all the spring onions. Crispy-fried chicken with Oolong tea leaves (脆皮茶薰雞) - the skin was crispy and yummy, but the underside - where the bones are - was very, very salty. Steamed coral crab with glutinous rice (紅蟳米糕) - this had gotten cold by the time it was plated for us, so I didn't like it as much as last time. It just didn't pack the same amount of flavor… and it was just cold and mushy. Caramel brûlée (焦糖燉蛋) - actually nice with vanilla, but just too sweet… even for a guy with a sweet tooth. I think most others felt the same way. And the portion was way too big for something this rich and sweet. Baked egg custard tartlet (酥皮蛋撻仔) - this was too small, and I felt the crust was too thick and threw the custard/crust ratio out of whack. 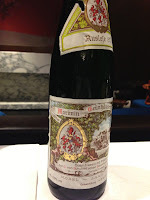 1993 von Schubert Maximin Grünhäuser Abtsberg Auslese 83 - nose of polyurethane, minerals, white flowers, and plastic. Still got acidity here despite the sweetness. 1985 Hugel Gewürztraminer Vendages Tardives en magnum - what would normally have been a beautiful wine was… bouchonné!!! Initially there was a whiff of white grapes and lychee. Then the nose faded quickly. There was some sweetness on the palate, but it was mostly bitter, and had no length. Another diner and I quickly agreed that the wine was gone. 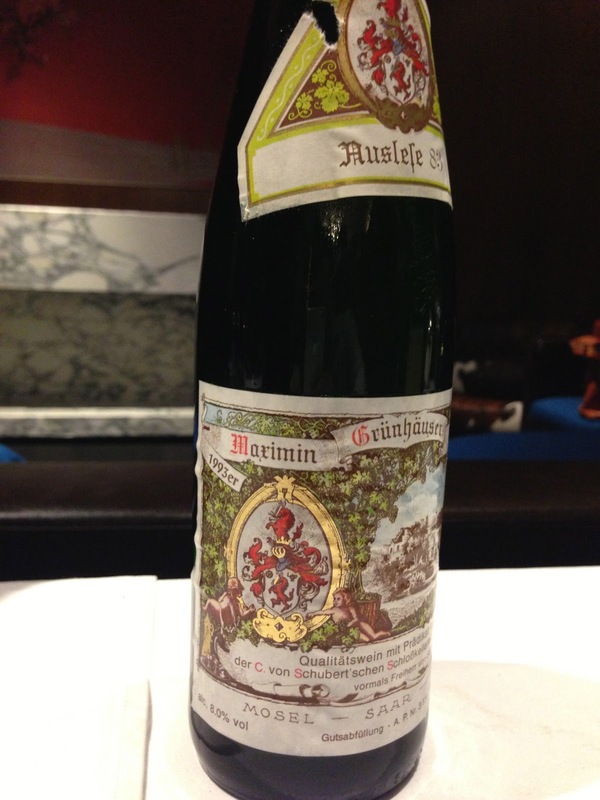 It wasn't as undrinkable as it could have been, but it gave me no pleasure to drink the wine. I apologized to the crowd for the unfortunate occurrence. Dassai Junmai Daiginjo 39% (獺祭「純米大吟醸」磨き三割九分) - nose of bananas, tropical fruits and sticky rice. 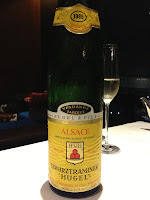 1983 Delamaine Grande Champagne Cognac - lots of caramel in the nose. The food was pretty good in general, although there were a few things that perhaps needed tweaking. The important thing was that it gave us all an opportunity to dine together, to celebrate old and new friendships. I look forward to more gatherings in the next year and beyond.